Recommended Service Interval: every 2 years regardless of mileage. Benefits: New Fluid Flushed through the system removes containments including water and metal. Dry Boiling point is 485°F and Wet Boiling point exceeds 311°F. This Fluid delivers exceptional performance in severe conditions. Directions: add SelTec® Heavy Duty DOT 4 Brake Fluid to master cylinder and let it flow through the lines allowing the fluid to escape at the bleeder valve at each wheel. Top off system and pump brakes to remove any air in the system. Use plenty of fluid to provide the best quality flush action to the system. Caution: Use all of the contents of the container as opened containers draw moisture and lowers boiling point. · Thermal stability is decreased. What Causes Depletion of Corrosion Inhibitors? What Happens When Corrosion inhibitors in Brake Fluid are Significantly Depleted? Note 1: This is very important-Corrosion inhibitors are designed to treat and protect the surfaces they are in contact with. So, as corrosion inhibitors are depleted the surfaces may still have some protection. There is a significant problem when a new hydraulic part is installed, a caliper for example.The other hydraulic parts have some protection from their exposure to the corrosion inhibitors in brake fluid, but the new caliper is unprotected. Since the corrosion inhibitors are now depleted the new part has no corrosion protection and can corrode very quickly. A thorough brake system flush is recommended to protect the new parts. Note 2: Corrosion in the brake system has been seen in vehicles after several years of operation where the brake fluid passed the 11703 standard. Some feel that 11703 cannot predict the affects of the long-term durability of the corrosion inhibitors in brake fluid. Automotive brake fluid has many responsibilities. Corrosion protection and lubrication of brake system components are only a portion of the role brake fluid must play. 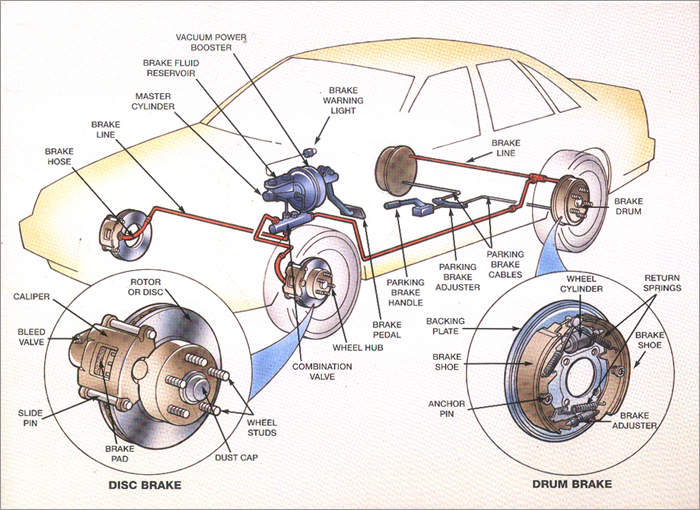 All automobiles that have a hydraulic braking system must use brake fluid in order for the brake system to operate. The type of fluid used can depend on the type of vehicle and the demands of the vehicles brake system. The two most common brake fluids used in the automotive industry are fluids that contain Polyalkylene Glycol Ether and fluid that contains Silicone or Silicium-based Polymer. Both Fluids are common but very different in regards to the manner in which they perform. Fluids containing Polyalklene Glycol Ether are more widely used and are the only fluids that should be used in racing brake systems. Brake systems may reach extreme temperatures and brake fluid must have the ability to withstand these temperatures and not degrade rapidly. Fluids containing Silicone are generally used in military type vehicles and because Silicone based fluids will not damage painted surfaces they are also somewhat common in show cars. Silicone-based fluids are regarded as DOT 5 fluids. They are highly compressible and can give the driver a feeling of a spongy pedal. The higher the brake system temperature the more the compressibility of the fluid and this increases the feeling of a spongy pedal. Silicone based fluids are non-hydroscopic meaning that they will not absorb or mix with water. When water is present in the brake system it will create a water/fluid/water/fluid situation. Because water boils at approximately 212º F, the ability of the brake system to operate correctly decreases, and the steam created from boiling water adds air to the system. It is important to remember that water may be present in any brake system. Therefore silicone brake fluid lacks the ability to deal with moisture and will dramatically decrease a brake systems performance. Fluids containing Poly glycol ethers are regarded as DOT 3, 4, and DOT 5.1. These type fluids are hydroscopic meaning they have an ability to mix with water and still perform adequately. However, water will drastically reduce the boiling point of fluid. In a racecar it is a major issue because as the boiling point decreases the performance ability of the fluid also decreases. Poly glycol type fluids are 2 times less compressible than silicone type fluids, even when heated. Less compressibility of brake fluid will increase pedal feel. Changing fluid on a regular basis will greatly increase the performance of the brake system. FLUID SPECIFICATIONS All brake fluids must meet federal standard #116. 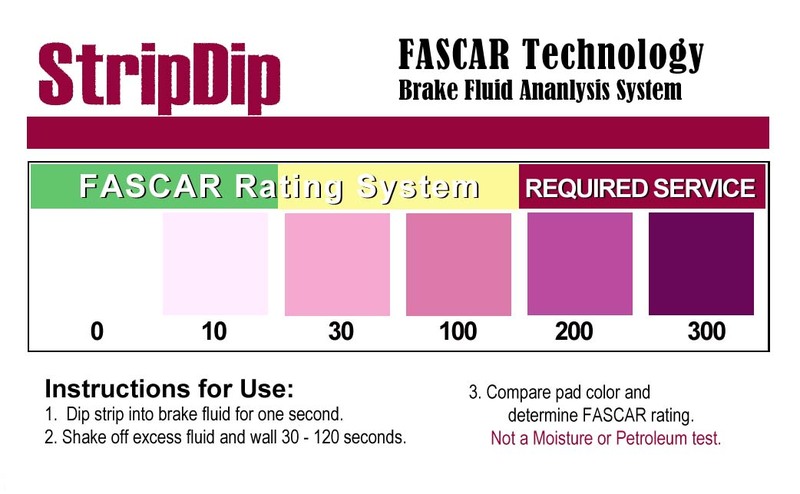 Under this standard is three Department of Transportation (DOT) minimal specifications for brake fluid. They are DOT 3, DOT 4, and DOT 5.1 (for fluids based with Polyalkylene Glycol Ether) and DOT 5 (for Silicone based fluids). Racing brake fluids always exceeds the DOT specifications for dry boiling points. Wet boiling points generally remain the same. AFCO's 570º brake fluid is a DOT 3 type fluid. However, it has a dry boiling point that is 52º higher than DOT 5.1 specifications, 124º higher than DOT 4 specifications and 169º higher than DOT 3 specifications. AFCO's 570º fluid meets or exceeds all DOT 3, 4, and 5.1 lubrication, corrosion protection and viscosity specifications. AFCO's 570º racing fluid meets but does not exceed federal standards for wet boiling point specification; therefore, its classification is DOT 3. Because AFCO's 570º fluid is intended for use in racing type brake systems that undergo frequent fluid changes, exceeding federal standards for wet boiling points is of little concern. Racing brake fluids always exceeds the DOT specifications for dry boiling points. Wet boiling points generally remain the same. The term boiling point when used regarding brake fluid means the temperatures that brake fluid will begin to boil. The minimum temperatures that brake fluids will begin to boil when the brake system contains 3% water by volume of the system. The temperatures that brake fluid will boil with no water present in the system. system, sometimes to the point that enough pressure is created to push caliper pistons into the brake pad. This will create brake drag as the rotor and pads make contact and can also create more heat in the system. Diffusion is another way in that water/moisture may enter the system. Diffusion occurs when over time moisture enters through rubber brake hoses. The use of hoses made from EPDM materials (Ethlene-Propylene-Diene-Materials) will reduce the amount of diffusion OR use steel braided brake hose with a non-rubber sleeve (usually Teflon) to greatly reduce the diffusion process. Brake fluids dry boiling point is more important then wet boiling point when used in a racing brake system. Passenger cars do not undergo a brake fluid change as often making the wet boiling point more important. Brake strip turns purple when water is present. If fluid remains in container be sure to tightly seal and do not store for long periods of time.